New vehicle pricing includes all offers and incentives in lieu of special APR or lease option. Tax, title, registration and dealer conveyance fee not included in vehicle prices shown and must be paid by the purchaser. While great effort is made to ensure the accuracy of the information on this site, errors do occur so please verify information with a customer service rep. This is easily done by calling us at (860) 645-4100 or by visiting us at the dealership. **With approved credit; Price/payments include rebates in lieu of special APR financing or lease option. Terms may vary. Monthly payments are only estimates derived from the vehicle price with a 72 month term, 3.9% interest and 20% down payment. See dealer for details. 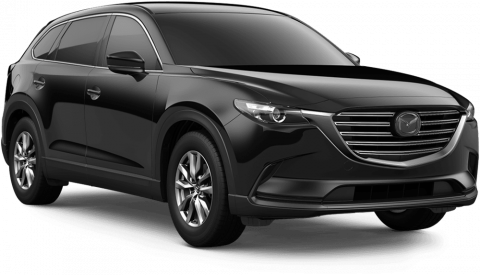 This 2019 Mazda CX-9 Standard features include: Leather seats, Bluetooth, Remote power door locks, Power windows with 4 one-touch, Heated drivers seat, Automatic Transmission, 4-wheel ABS brakes, Compressor - Intercooled turbo, Air conditioning with dual zone climate control, Rear air conditioning - With separate controls, Adaptive cruise control, Audio controls on steering wheel, Universal remote transmitter, Traction control - ABS and driveline, 2.5 liter inline 4 cylinder DOHC engine, 227 hp horsepower, 8-way power adjustable drivers seat, Head airbags - Curtain 1st, 2nd and 3rd row, Heated passenger seat, Multi-function remote - Trunk/hatch/door/tailgate, Passenger Airbag, Power heated mirrors, Tilt and telescopic steering wheel, 4 Doors, All-wheel drive, Fuel economy EPA highway (mpg): 26 and EPA city (mpg): 20, Compass, External temperature display, Tachometer, Clock - In-radio display, Power Activated Trunk/Hatch - Power liftgate, Rear spoiler - Lip, Satellite communications - MAZDA CONNECT, Stability control - With Anti-Roll, Trip computer... Carter of Manchester has been named 2015 and 2014's Dealer Rater, Chevy Dealer of the Year Award Winner as well as 2014 & 2013's Mazda Dealer of the Year in the state of Connecticut! Mazda of Manchester has also been named a Mazda Gold Cup Dealer for 2015! A family-owned and operated business, Mazda of Manchester is part of a Manchester automotive tradition dating back 80 years. Over many decades, we’ve helped build a business model that gives our customers an exclusive dealership experience.